Trading Recap: Recoup Recap! +$6.7K! What’s up, everyone? All right, so here we are, finishing the day up 6760 bucks. I’m wearing red, and it’s my lucky color. After two red days in a row, I was like, “You know what? Screw it, I’m going to wear red today and let’s just see what happens. If I have another red day, then I’ll never wear red again” but today, I wore the red shirt, wore the red t-shirt, I’m all red, and I am green on the day. That’s what I needed. Today was a quick bounce back. Was down $7000 yesterday, now up 6700 today, so basically last two days are a wash, and I can get back to focus on the 100k monthly goal. $25,000 off that level right now, that means $5000 a day for the next five days. That’ll get me there. Can I do it? I don’t know. We’ll see. I think I can, but it’s just a matter of if we keep seeing good opportunities. Today there was an opportunity, a trade that I took where I tried to take 12,500 shares, and they only filled 1700. Well, I made $4400 or something like that on the trade. If I’d filled 12,500 shares, I would have made like 15-20,000 bucks. So, if we get an opportunity like that, and I get filled on my entire order, well, in one day I could be at the 100k level, or in two good days I could be there. So, it’s not really on me as much as the market. Will the market give me opportunities and will I get filled on the orders? Time will tell. We’ve got five days left. So, anyways, let’s break down today’s trades in today’s midday market recap. All right. We’re going to break down the trades from today. Another good day of trading, things finally started to bounce back, finishing the morning up $6760.02. Not bad. I’m wearing my red shirt, so today I decided to do the reverse jinx, because I’ve been wearing all my good luck colors for the last few days, and I was red on Monday, and red again on Tuesday. So I said, “You know what? That’s it. I’m going to wear my red shirt and we’re going to turn things around.” Red sweatshirt today, red on the t-shirt, turning things around and it worked. Up $6760. You’ve got to believe in the colors, because there’s a lot of power there. All right, so you can see the P&L from this morning. The last couple days were choppy, and yesterday I pushed it a little bit too hard, got myself into the red. Down whatever, $6900, but today a rebound day. I hit the ground hard yesterday and bounced right back up today, just like a tennis ball. Now I’m basically back to where I was yesterday morning, before I started trading, which that’s cool. Quick little bounce back, quick correction, and so back to heading to 100k, right? Next stop $100,000 for the month. You can see here, five different stocks I traded. Eight trades total, seven winners. Accuracy is pretty good today. A couple of higher risk trades I would say, and I was wonderful if I was being a little bit too aggressive, but it ended up being the right move. WMLP, this is the big mover today. Even as of right now, it’s still up a good 182%, which is crazy. That’s a big move. I jumped in with 1700 shares at 2.05, so my first entry was down here. It squeezed up to a high of 2.09 and got halted, and this was the one that I’m going to show you first, just because it was the big winner. I jumped in this, I put out orders to buy. I saw it and I was like, “I’m getting in.” I put out 12,000 shares of buy orders and I filled a little bit of each one, enough to get me one commission on each one of these five orders, but I only filled 1700 shares. That’s not uncommon when you try to buy a stock, just as it’s about to get halted, that you don’t get filled on the whole order. On this one, the reason I was aggressive on it is because it had just squeezed from $1.50 to 2 bucks, and when stocks show that level of strength, I want to try to capitalize on it and ride that momentum. I jumped in aggressively, basically a little above the $2 proper entry point. Proper entry point was $2, I was getting in at 2.04, and 2.09. Little high. It gets halted, and it resumes at a low of 2.15, and squeezes up to 3.10. Going into the move to 3.10, I added at 2.50, 2.93, 2.96. I added at 3.06, 3.06, and then I guess I started selling here. I had a total of 16,000 shares right up here, and my average was 2.82. It dropped for a second down to 2.50, and I was down like 4500 bucks. I was like, “Uh oh. This is going to be third red day in a row. Let’s hold on tight, let’s see what this does.” Then it popped right back up, did the one minute micro pullback, and tapped 3.39. So just like that, I booked the profit, and that was like at that time, $3600. Basically right in that opening range squeeze. Couple little scalp opportunities in here, but for the most part, this was fairly choppy, and then I got back in at 3.50, 3.49 for the break over high of day. Back in, like I said, a couple little scalps in this area, nothing that exciting. The next solid trade was getting in at 3.44, anticipating the break over the half dollar, so that was when we had this kind of curling consolidation right here. Starting to curl up, got in at 3.34, ended up selling some at 57. Oh, sorry, sorry, sorry. I did take that trade. That was in this breakout right here, and then I got back in on this five minute breakout at 10:10. That’s the one where I got in at 49 and then I was selling and adding back at 67, selling, adding back at 84, and finally adding at 95. I was looking for a break of $4. We ended up hitting a high of 3.97. 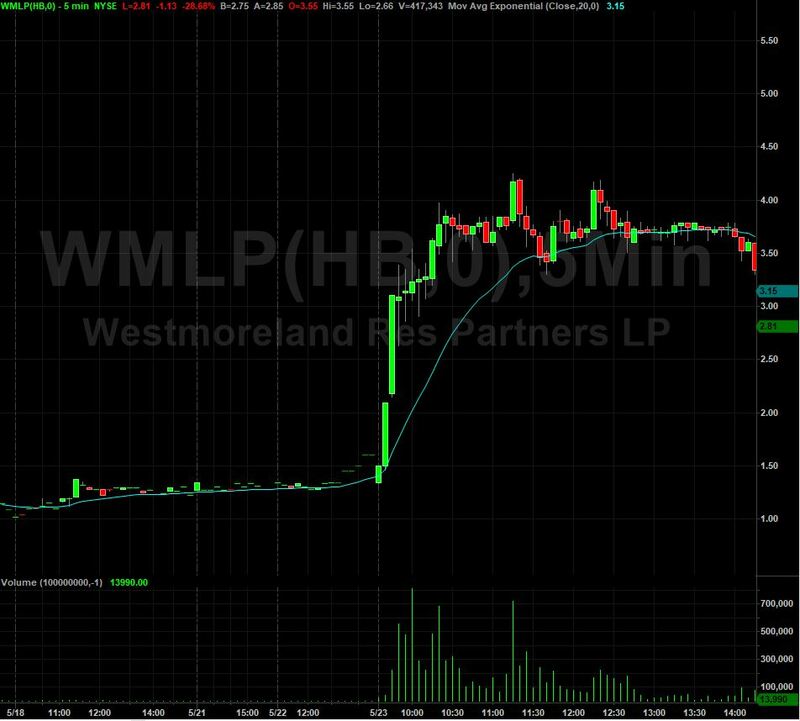 We didn’t quite break that level, but I made another 750 bucks in that move right there, and so that put me up $4215 on WMLP. Up 182%, 175% now on the day. Not bad at all, especially for my $2 initial entry. I know some of you guys, Josh, he said he got in at $1.65, which was an awesome entry. Jay, I know you got in at a good price. I think it was David made 7500 bucks on this one this morning, so lots of you guys were able to capitalize on this move which is awesome. So, great job on those trades. That was the big one. 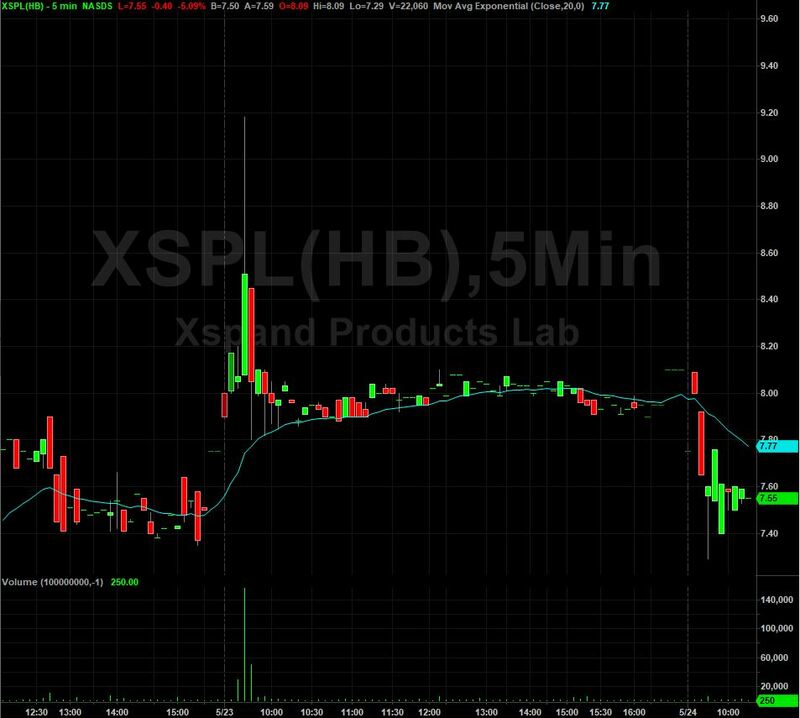 XSLP or PL. This was one that we were watching, because its recent IPO breakout. Weren’t sure it was really going to work, but you see here it started to curl up and as it squeezed over the high of day, this is kind of an opening range breakout. That’s the opening range, that’s the bottom of it, so as it broke the opening range, it popped up from 8.19, all the way up to 9.18. I jumped in this at 8.25, and 8.40, and 8.68. Would have been nice if I got the whole thing filled at 8.30, but I add as they go up, and sold at .92, and then the rest at .53. That was a $2700 winner on that one, with 7000 shares or something like that. Didn’t end up holding very well, so kind of disappointing. First trade out of the gates was on AVGR. This one, it was on our gap scans. I just didn’t know if we’d be able to trust it. I jumped in for the break over $2. I got in at $1.99, and it … I got in at 2 and sold at 2.02, $217. Ended up popping up to a high of 2.23, but not before dropping to $1.94. It dropped, and then it took off, so a little bit choppy on that breakout. 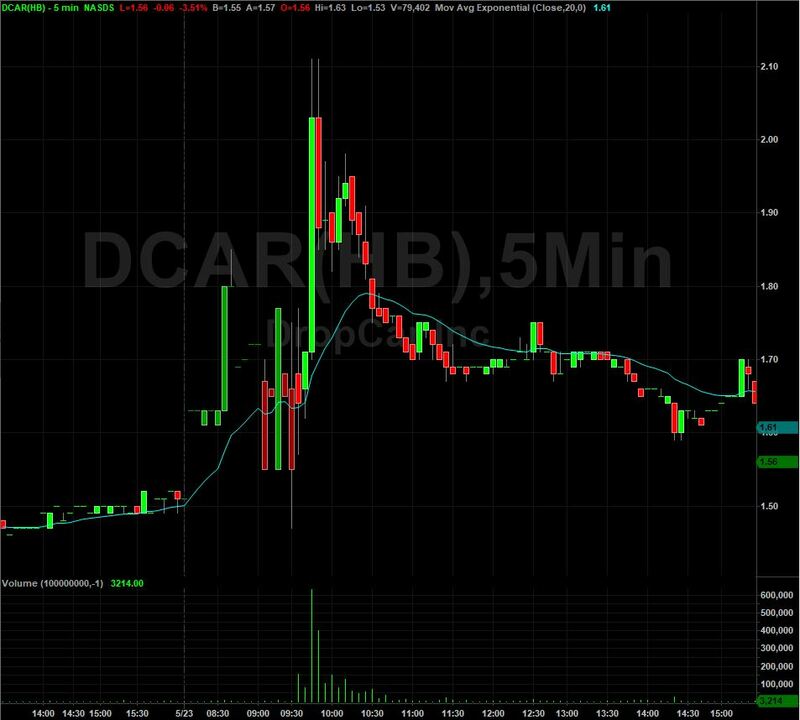 Then, we had DCAR, D-C-A-R. Little scalp on that, 10,000 shares, in at $1.95. Looking for the break over 2, it hits 2.11. So, small winner on that one. That was on the scanners, squeezed up and tried to ride the momentum. Wasn’t as strong as WMLP obviously. And CHKE, the cheapest stock I traded today. In at $1.28, and stopping out at $1.20, right around here. Pops up, hits a high of 32, I thought maybe it would continue higher, especially since these lower priced stocks have been moving. I was in with 10,000 shares and stopped out as it came back down here. So, $900 loss on that one, and that puts me up $6760 on the day. Nice recovery, so back to about 75-76,000 on the month, and right now, still looking at 100k on the month as a possible goal. We’ve got one, two, three, four, five days left. 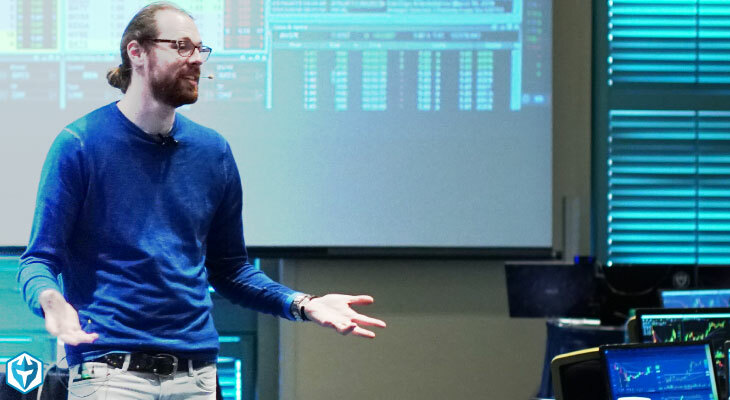 Remember, the markets close on Monday for Memorial Day and for Memorial Day I’m giving half my profits to various organizations in the Berkshire. I already talked about this a bunch of times, but we’re doing this in honor of Memorial Day, so half my profits this month are being donated. We’re setting up this new office in the Berkshire, so we wanted to donate to local organizations. That’s exciting. I won’t do the donation really until June 1st, ’cause I’m donating half of my profits for the month of May, so I want to let the month finish before I do those donations. Markets close Monday, but we’ve got five days left. For me to hit 100k, I need to be averaging 5000 a day for the next five days. Oh, did you go to the Berkshire School in Sheffield? That’s cool, Ian. Yeah, I don’t think I can donate there, ’cause I don’t think they’re a non-profit. But that’s cool. It’s a nice school and I’m sure they do a lot of stuff for the local community. Let’s see. What was I going to say? Yeah, $5000 a day average to get to 25k. I don’t know if that’s going to happen. I might not hit 100k this month, but there’s always hope and I mean, stocks like WMLP, if I’d filled 12,000 shares of this, this would have been a $12-$15,000 day, right? $12-$15,000, just on the day, so it could happen. It might happen tomorrow. I might have a $25,000 day just tomorrow and boom, I’m at 100k. On the other hand, we might have slow days and I might end up just having to grind on 500 to 1000 a day, and finish the month around 85,000 or something like that. But we’ll just take it one day at a time, things really bounced back today, red, my lucky color, feels good. Got to find something red to wear tomorrow to keep this momentum alive. All right, so that’s the game plan and all of you guys, I will see you back at first thing tomorrow morning, 9:00-9:15, for pre-market analysis. Hopefully we’ll see some good stocks to trade and we’ll be able to make a little bit of money tomorrow. All right, so that’s the game plan, I’ll see all of you guys first thing tomorrow morning. If you’re still watching you must have really enjoyed that video, so why not subscribe and get email alerts anytime I upload new content? Remember, when you subscribe, you become a member of the Warrior Trading family.